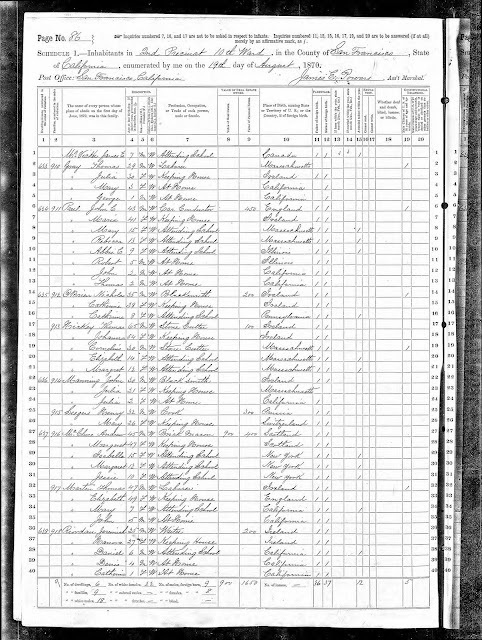 1870 United States Federal Census, San Francisco County, California, population schedule, San Francisco Ward 10, Page 247B, dwelling #624, family #911, John C. Paul household; digital image, Ancestry.com (http://www.ancestry.com : accessed 12 June 2017); citing National Archives Microfilm Publication M593, Roll 83. 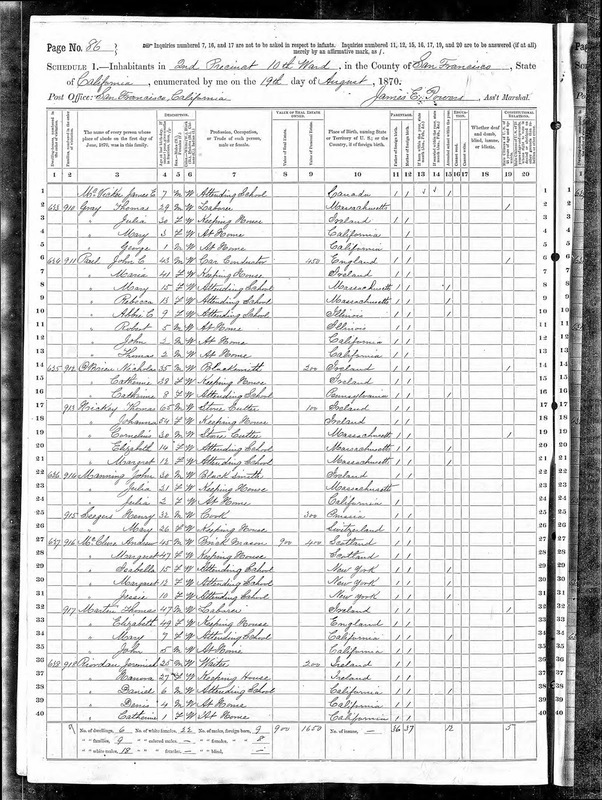 Comparing this census record to the 1860 U.S. Census record, John C. Paul and Maria Paul are several years younger, Mary Paul is a year younger, Rebecca Paul is the same age, and the Robert Paul from the 1860 census is not in the family; there is a Robert Paul born in about 1864 in Illinois in this census. There are three other children, Abbie born in about 1861 in Illinois, and perhaps twins John and Thomas age 2. This census provides an indication that John C. and Maria (Beamish) Paul moved from Massachusetts to Illinois between 1857 and 1861, and from Illinois to California between 1864 and 1868. John C and Maria T. (Beamish) Paul are Linda's second great-grandparents through their daughter, Mary Ann Paul (1854-1908) who married Herman Schaffner (1854-1921) in about 1876.